danielle abroad: god bless the u.s.a. I have never felt more proud to be an American. I ended up falling asleep before the final count yesterday (we're 2 hours ahead over here!) but I did hold out long enough to project who the elect President would be... so, when I awoke this morning and ran to look up the results, I wasn't surprised... but that doesn't mean any less thrilled. This is our time, to put our people back to work and open doors of opportunity for our kids; to return to prosperity and promote the cause of peace: to reclaim the American dream and reaffirm that fundamental truth, that, out of many, we are one; that while we breath, we hope. And where we are met with cynicims and doubts and those who tell us that we can't, we will respond with that timeless creed that sums up the spirit of a people: Yes, we can. My gosh, what a guy. I was literally brought to tears early this morning by the words of the new President. Then my friends and I (all Obama-voters) had a discussion today in our Spanish class about the election, the victory, the next 4 years. President Obama obviously had a lot of support and they are millions of millions that pleased, excited, relieved with his win, but, living abroad during this time, during the most critical part of the campaign, we are experiencing a different emotion, one that I'm not even sure I can put into words. I'll try my best. Our unexplainable actions over the last eight years have left the U.S. disliked by many. And as such an unfortunate anti-American sentiment has swept the world. For all of the educated and wonderful Ecuadorians, Chileans, French, Germans, Canadians, etc. that I have met over the past 6 months, not one has held their dislike for Bush against me, but there are many who would have. Quite frankly, it's a dangerous time to be an American in a foreign country. But today, I wouldn't think twice to walk through the streets proudly displaying my nationality on my sleeve. The U.S. is a strong and influential player in the world, practically everyone was watching us yesterday. If not interested in the future of our country, simply because they cared about the future of their own. Whether it's through economics, foreign policy, immigration, what have you, Americans have a large influence beyond their shores. And with this point, I cannot tell you how incredible it is to see people, non-American citizens, most whom have never set foot in the United States, so overwhelmingly hopeful. Yes we can, Obama, yes we can. Now, as I sit in the Starbucks at Pedro de Valdivia with a smile on my face and in complete content with my country and my experience outside of it, I have never felt more proud to be an American. 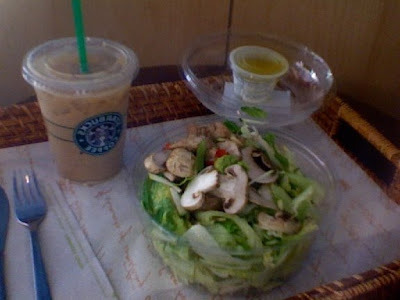 Lunch was very tasty, a large Sesame Chicken salad with mushrooms, cucumbers, palm hearts (which I quickly picked out, ew!) and a lemon juice-olive oil dressing alongside a Grande Nonfat Latte. I think I'm ready to go into the last stretch of homework prep for the two weeks ahead and I better be! Mi mama y mi papa are arriving at 7 am tomorrow and I've got to be ready for the amazing adventure I've got planned for us. YAY :) Very very Happy Humpday everyone!